Sort of a quick meal like under 20minutes, thats quick right? 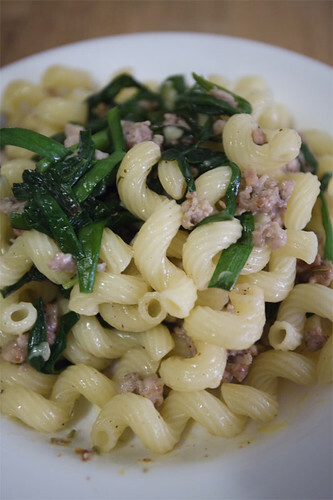 While the water for the pasta was heating up, I cleaned and chopped the chives and added few tablespoons of fennel seeds into the ground pork and seasoned it. Prep everything before cooking the pasta. So while the pasta was cooking, I added the ground pork to a very hot pan because if its not hot enough I’ll just be steaming the pork. When the pork was all done cooking, I added the chives. The chives doesn’t take that long and then I added couple big spoons of creme fraiche. Tasted the pork and chives mixture and seasoned correctly. I also grated some parmesan cheese and gave it a good stir. Add pasta when done and mixed it really well. Then I added some more cheese, why not. 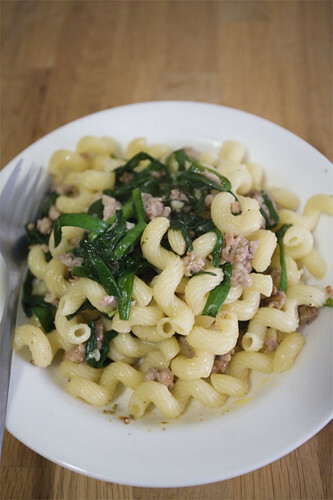 This was pretty good, the Chinese chives were a bit awkward only because I’m used to eating it as a Chinese dish and the fennel seeds in the ground pork really added a lot to it and transformed plain old pork into something fantastic.